Inclement weather or an impending tropical depression was not enough to prevent the thousands who ascended the scenic Fort Shirley at the Cabrits in Portsmouth, the home of the 8th Jazz and Creole festival organized by the Discover Dominica Authority. This 2017 edition was the best yet and must have left questions about venue size and accommodating massive crowds already expected for Dominica's 40th year of Independence-Reunion 2018. There is no doubt that this show is growing at a faster pace than previously envisioned even though there was the St Lucia's jazz festival next door just a couple months before. The Lucians have been trying to reposition their tourist generating activities as it is now becoming a burden on state resources. Dominica with a much smaller budget has been able inside of 10 years to do magic by way of planning and a targeted marketing strategy employed by DDA CEO Collin Piper and his hardworking crew of Monique, Kelly Ann, Sammy and the rest of the DFC and DDA staffers. I must say I was one of those who were a bit skeptical, about having one renowned international Jazz act in the person of British-born Courtney Pine. I am aware of the potency of the fastest rising Dominican group Breve and their extensive Jazzy repertoire amidst their fusions of Reggae, Pop, Ballad and the like. Of course none can dismiss the most formidable female performer if not in the English speaking Caribbean but certainly in this OECS sub region, in the person of the sensational Michele Henderson-Delsol. However, last week Sunday surpassed all expectations for what now must be considered a small fee of $75. Apart for the organization and planning re food stalls, change over from one set to the next, the Hi -Fi music of DJ Cut, the musicianship, precision and harmonization exhibited was of world standard. In fact Dominica's music festival is rated in the top 10 in the Caribbean region. One of the philosophies that I hold is that only Dominicans can run their festival and it has been proven. Only our people can make big things happen from small budgets, make blood from stone, deal with useless bureaucracy and procrastination, ' kiss foot' when we have to, all in an effort to make it happen. At the festival, Phaze Five Steel warmed up and serenaded the gathering patrons; an extension of what was happening at the Fort by two dedicated pannist, from the Posse Steel who were strategically located. Before one could breathe or exhale in this wonderful ambience of Fort Shirley, Breve, the band, was introduced by MC's former Queen Leandra Lander and Kareem Bertrand, a member of the Sisserou Singers. Guitarist Maxian, bassists Gomez, saxophonist Jussi and lead singer Jade and company transformed minds and hearts with a professional representation of their artistry and their special brand of music embracing their maxim 'music, love and peace'. They did something special with varying genres- Folk, Cadence, Pop, Rock, Jazz of course, and toasted us with their fast rising hits from their debut album release "Runaway" and the promotional video commissioned by the DDA, 'Welcome to my Island.' The audience, umbrella up and all, could not get enough and kept singing along even while singer Jade invited patrons to 'runaway'with them. Though the temptation was strong to do just that, but Michele Henderson-Delsol was announced and that was reason enough to stay. Dominica's only real professional act on island who has played with , have been accompanied by, and shared the stage with world greats such as Doggy Fresh and legendary multi Grammy award winner Chick Corea just to mention two, began with my all-time favorite " Home". Compositions from "Sound Check" (her most successful album to date) was also featured, as well as a range of other original hits. At home was no less than five Francophone classic musicians on keys, drums and saxophone who joined up the Dominica trio of guitarist Jerry Moulon, husband Junior Delsol on bass and Posse's own Leon St Jean on keys. It was obvious that a lot of rehearsal preparation was done judging from the seemingly flawless execution and precision of each number ranging from greats such as Michael Jackson, Stevie Wonder and even delightfully jazzing up some local Folk renditions. Meanwhile, the saxophonist was out of this world as he had a response to almost every note Michele uttered as his instrument responded in a language of its own. The background vocals of Bouyon Queen Carlene XP and Shalena of C squared and Ti Orkest respectively, all added colour to the remarkable range and well-oiled vocal chords of Dominica's princess of song. She took the opportunity to acknowledge the contributions of Ophelia and Pearle Christian in her formative years. Very noble indeed! Courtney Pine was next and he proved that he was a great communicator as well as a Jazz saxophonist of international repute. Though he was not very long, in keeping with his contract, the mastery cannot be translated by words. One would have to be present to witness the cries, pains and joys emanating from his instrument of choice as he sought to promote, through his music, black identity and consciousness. On his music journey he was accompanied by Cameron Pierre, Dominica's most internationally acclaimed musician on guitar who also resides in London, a double bass player, a double second pannist, a lead guitarist and drummer. They all shared moments featuring their dexterity and mastery leaving the audience spellbound. A sensational Venezuelan quintet of singers "Vocal Sound" whose voices play the instrument as the only accompaniment to the songs they sang and performed too, demonstrated through this unique act why they won a Grammy for Latin music a few years ago. We are talking about world standards not frequently witnessed in the Nature Isle. 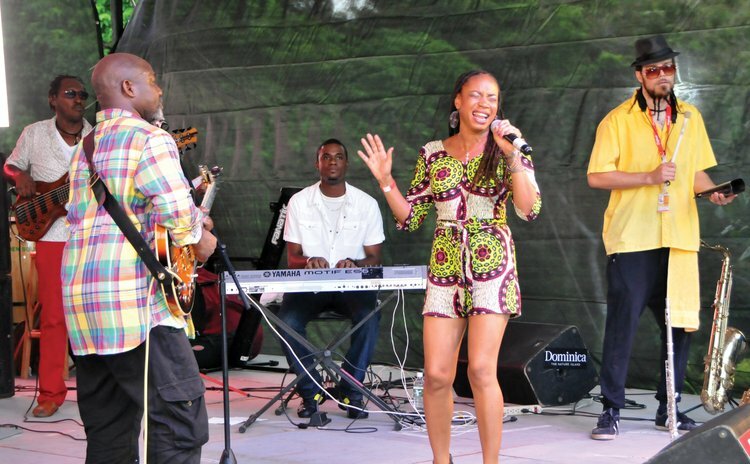 Their Spanish-English repertoire feature Caribbean music, Hip hop, Ballads, Techno and even Opera! Then, bringing down the curtains was the irresistible youthful Ti Orkest- two-time winner of the NCCU Cadence band competition. They stopped departing patrons in their tracks, as their musical cannons at the Cabrits exploded with an Exile One medley, before Shalena and the talented Mel C got into their act and set the cannons loose at Fort Shirley.